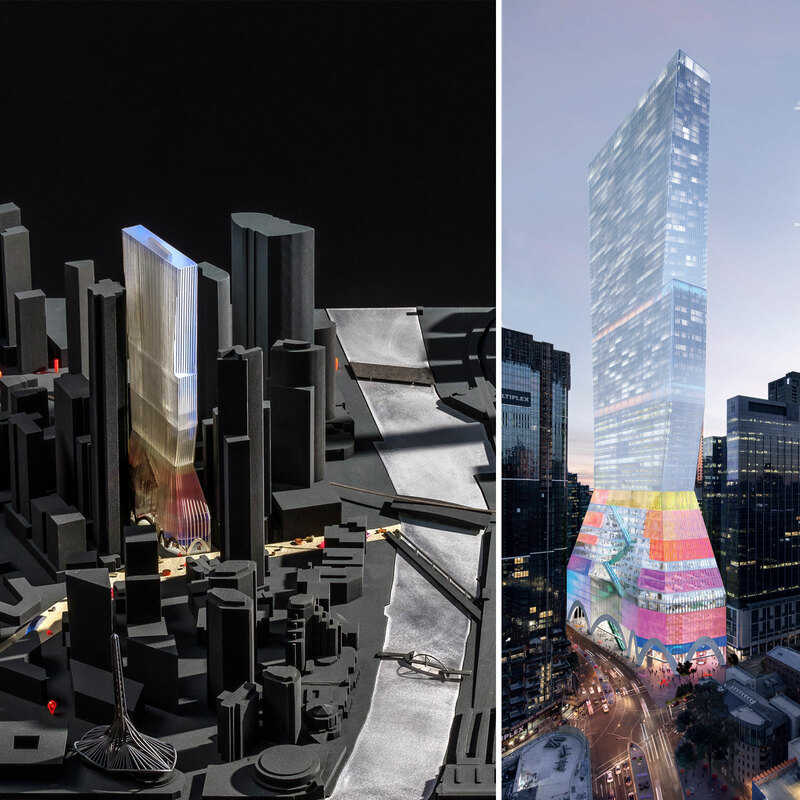 The six teams shortlisted for Beulah’s landmark BMW Southbank site have unveiled their designs. 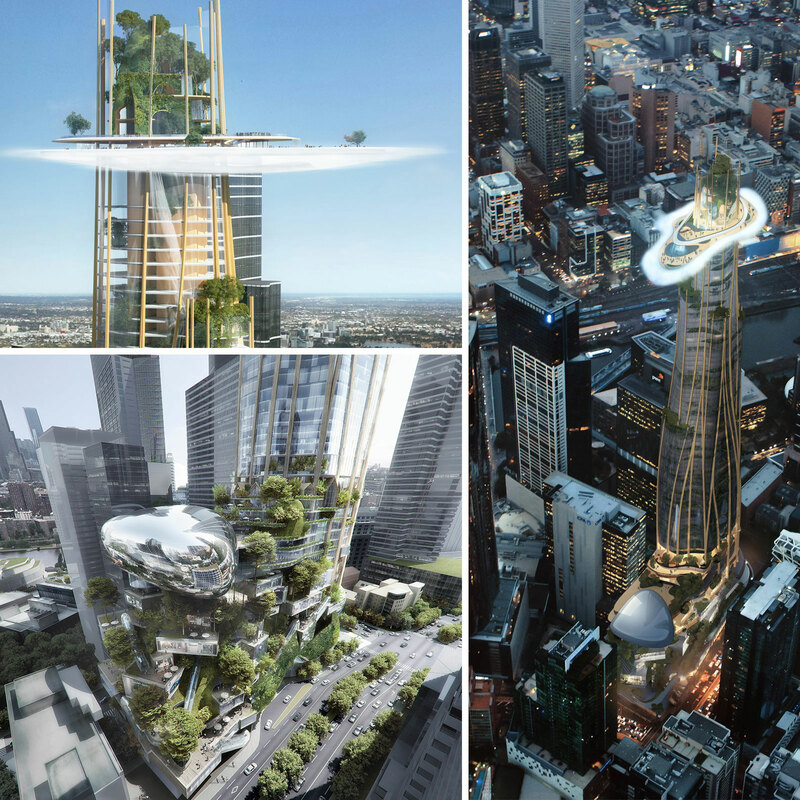 Among the designs are an illuminated cloud-shaped hotel, publicly-accessible botanic gardens on the roof of a skyscraper and a tower shaped to look like a propeller. 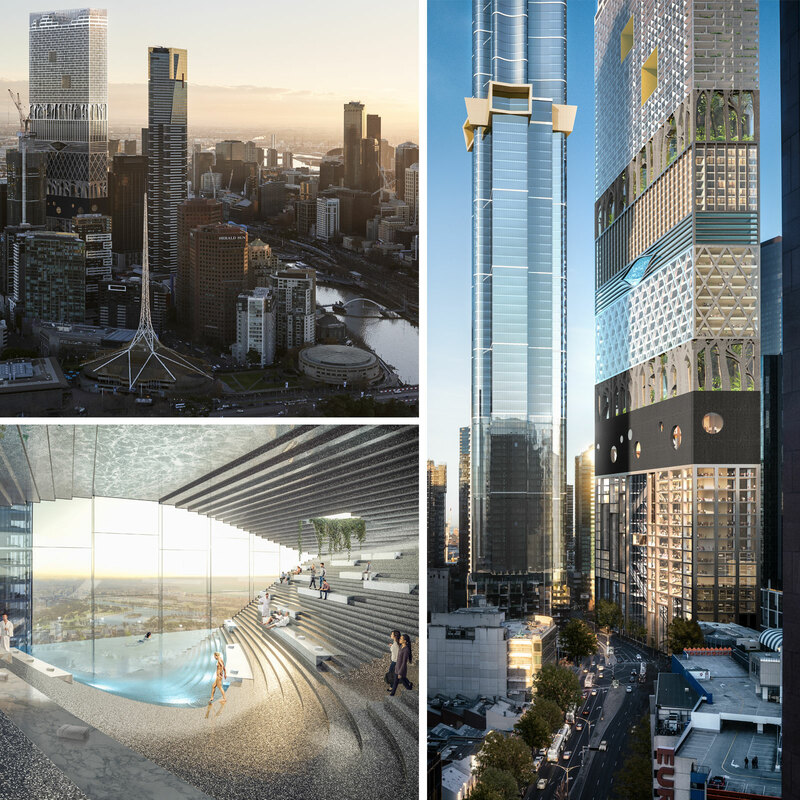 The $2 billion project will be the largest single-phase project in the history of Victoria, and promises to create a vertical city on Southbank Boulevard. Beulah acquired the 6,061sq m BMW Southbank site late last year in a deal valued at more than $100 million. The developer said that it hoped to create a state-of-the-art, integrated mixed-use environment that would include retail, hotel, residential, commercial, cultural and public spaces. “Our overarching vision is to turn the BMW site into a landmark lifestyle destination that will be recognised around the world and that contributes to the surrounding community by lifting the urban fabric to a new level,” Beulah International executive director Adelene Teh said. 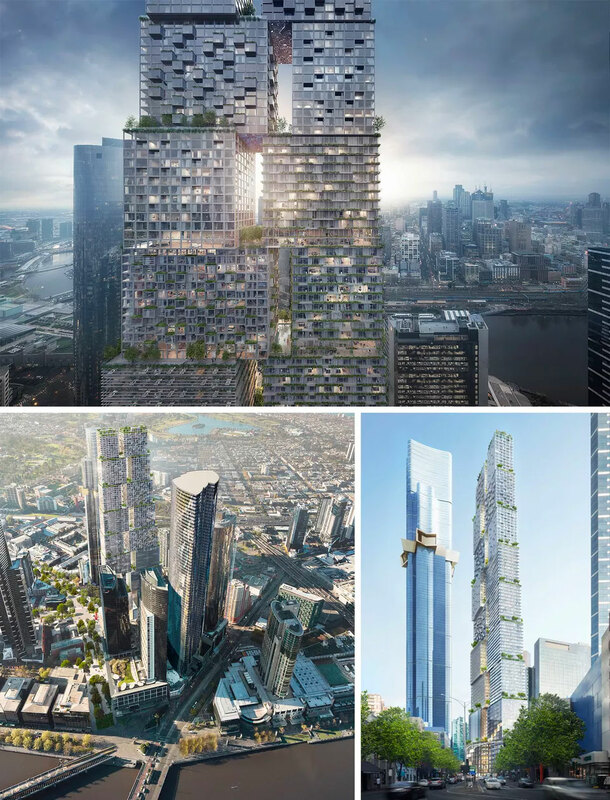 Reaching 360 metres, MAD Architects and Elenberg Fraser's proposal includes 43 floors of residential apartments and 24 floors of hotel rooms. The hotel’s public offering, “The Cloud” will be located at 317 metres high, which will have 360-degree view of the city. “Urban Tree will feature small, green foothills that lead pedestrians up to the ‘mountain village’, with amenities along Southbank Boulevard including a children’s playground, public artwork and a water feature,” the architects said. The proposal also includes a 1,200-seat auditorium, 800-seat concert hall, a library, a cinema, a food hall, an organic supermarket, commercial office spaces and a childcare facility with outdoor terraces. UN Studio and Cox Architecture have produced a two-tower design with a twisting geometry of glass facade and terracing. 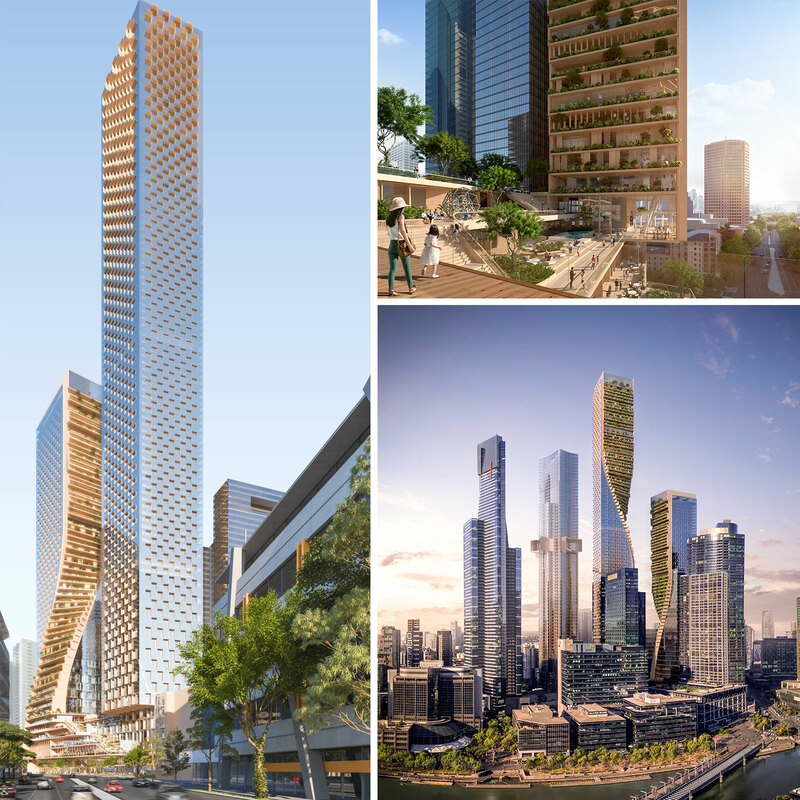 The residential tower will reach 356.20 metres high, crowned by the Future Botanic Garden, a publicly accessible garden in the sky while the hotel and office tower will reach 252.20 metres high. Green Spine​ will include residential, office, hotel, entertainment facility, BMW Experience Centre, Childcare Facility, School, Retail and Food Precinct complete with a food hall, cinema, library and interactive spaces. 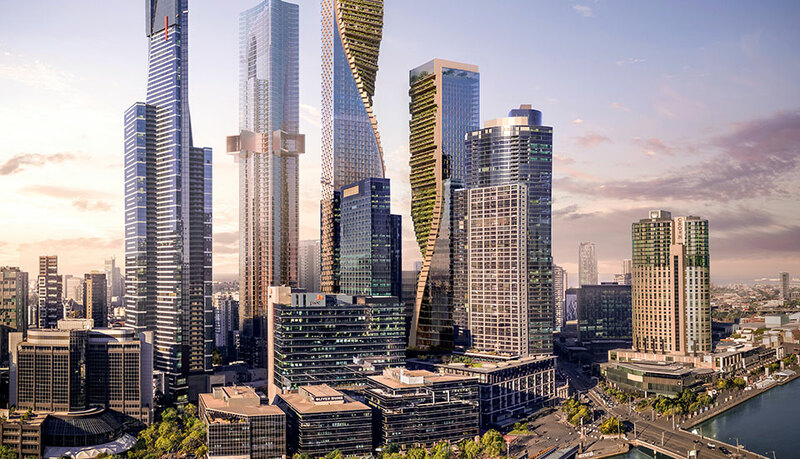 Coop Himmelblau and Architectus have proposed Propeller City, a “vertical city” that will reach 335 metres and will comprise four main structures. A public podium will include 18 floors of retail spaces, cultural institutions, childcare, entertainment, exhibition, cinema, recording studios, food hall, beauty and wellness. The tower will also include 16 floors of offices, 46 floors of residential apartments and a 15-storey hotel. The Lanescraper, designed by Bjarke Ingels Group and Fender Katsalidis Architects, comprises two blocked towers ​reaching 359.6 meters. The two-tiered concentric auditorium that will seat in excess of 3,000 patrons and a BMW experience centre that occupies four levels, connected by a central void and car lift around which a spiral stair meets all levels. 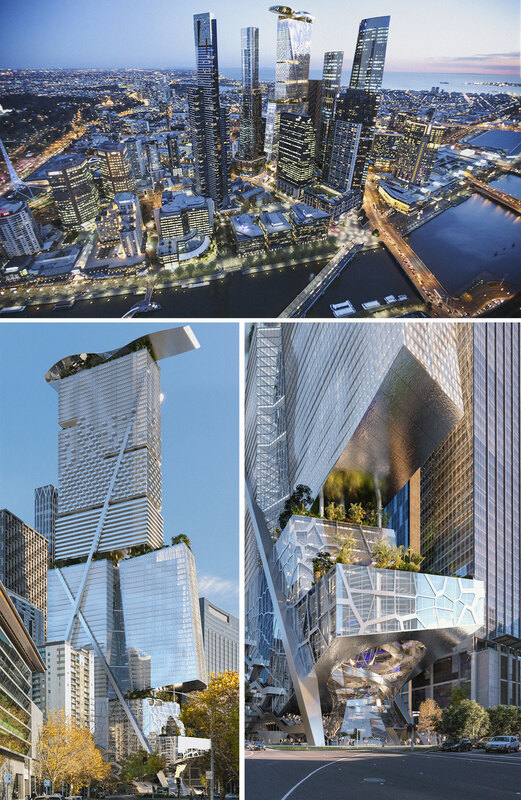 Reaching 359.6m tall, the proposed towers ​will include retail and culture amenities, including a library and both informal food areas and formal restaurants, as well as office, hotel and serviced apartments and residential. The design by Office of Metropolitan Architecture and Conrad Gargett emphasises the base of the building over the crown, with a “ground floor market” that the architects say is inspired by Melbourne’s arcades and vaulted markets. A commercial tower holding offices, a hotel and residential floors would sit above the market and the “vertical city”. Reaching 359 meters high, ​Stack​ by MVRDV X Woods Bagot, features a hotel pool in the centre of the building, complete with an underwater city window, surrounded by an amphitheatre of terraces and stairs. Each bar within the stack has its own appearance in pattern texture and shade, reflecting the building barcode of functions. This ranges from openable façades at the park levels and transparent façades in the public retail facilities, with a tree-like structure representing the park and a beehive structure marking the residential part.